“Then it doesn’t matter which way you go,” said the Cat. “—so long as I get SOMEWHERE,” Alice added as an explanation. Unlike Alice, I have had a pretty good idea during my twenty-five-year career of what I wanted to accomplish and where I wanted to end up. Certainly, I have taken detours and done things that I had not considered early on. However, the basic trajectory went pretty much as I had planned. I attribute that to always having the end goal in sight. But not everyone does this. In early 2012, I conducted a survey of more than one thousand professionals. The survey focused on where people were in their career compared to where they thought they would be. The results are interesting: Only 18 percent of the respondents felt that they were ahead of where they wanted to be; 38 percent indicated that they were behind where they thought they would be; and approximately one in ten had never considered the question. A key professional challenge is knowing how to plan a career. Without a career plan, it is easy to become stuck in the middle. When I began my own career, I identiﬁed the major milestones for my career and roughly when I wanted to retire. In order to make sure I was heading in the right direction, I needed to know my final destination. I needed to decide whether those milestones and directions would be driven by money, some overarching goal like starting my own business, or achieving certain levels in a corporate environment. In the end, I decided to pursue a career in marketing by working in large high-technology ﬁrms. I set an overall goal of being a chief marketing ofﬁcer by the time I retired. For that to happen, I needed interim goals and a timeframe for achieving them. For example, by age twenty-five, I needed to be a manager of some sort. By age thirty-five, I wanted to rise to the senior director level. And so on. When setting these goals, I wanted to make sure that (1) they would help me achieve my overall aspiration of becoming a chief marketing ofﬁcer and (2) that the goals were realistic and achievable within the stated timeframe. It was important not to set myself up for failure or frustration by having goals that I could not realistically achieve. Having a plan in place, at least in my own mind, allowed me to focus my career decisions on moves that would help me accumulate and build the skills and experience necessary to move to the next level and closer to my ultimate goal of becoming chief marketing ofﬁcer. This plan also helped me to understand the types of contacts and network I would need in order to achieve this goal. No matter what your ultimate career goal is or how deﬁnitive that goal may be, it is worth taking the time to create a plan to achieve it. Without a plan, you will ﬁnd it difﬁcult to know if you are going in the right direction or staying on course. Without a timeline, even if you need to expand or contract it at different points, you will not have a realistic chance to achieve your objectives. 3. How quickly do you want to get from here to there? Answering these questions may seem difﬁcult, but doing so is essential to effective career planning. It is never too early in your career to consider this questi You need to decide what success will look like for you at the end of your career. You need to articulate what matters to you and where you want to end up. The answer to this question can certainly change over time, but it is the starting point for any career plan. Depending on what you ultimately want to achieve, this goal could be money, career status, social position, or anything else that could drive you to be successful. Remember, this is about what you want, not what others expect from you. Your goal can help you deﬁne what is important to you, and where you think you are going to be when you retire. Once you have articulated where you want to go in your career, it is time to assess where you are today relative to that go To determine where you are today, you can use the same process that you used to determine where you want to go. If your goal focuses on money, take the time to review your current ﬁnancial situation and determine where you are today money-wise compared to where you want to be. If your goal focuses on career position, deﬁne your current role including your responsibilities and experience. Where you are today is your starting point. Be honest about where that is, because it will help you determine the best way to achieve your ultimate goal. The ﬁnal step in this career planning process is drawing the line that will connect where you are today with where you are headed. How will you get from here to there? To make this process easier, divide your timeframe into manage- able chunks. If you want to own your own business or become a senior executive of a company in twenty years, divide that twenty years into smaller timeframes of four or ﬁve years each. Do not make these intervals too short, or you may be setting yourself up for repeated failure. It is better to overachieve some steps by going faster than anticipated than to miss all of them because you did not give yourself enough time to achieve each level. What can you do in the next ﬁve years to move yourself closer to your goal? If you want to become a chief ﬁnancial ofﬁcer within twenty years, you will need to take on a series of positions with progressively more responsibility within ﬁnance. In the current business climate, it also helps to gain experience in other areas of company operations. What is the next role or position that you should attain on your journey? Take time to think about the steps you will need to take and how they ﬁt in your chosen timeframe. Consider how you will move from your current position to, say, a director and then on to vice president and so on. Seek out and nurture strong relationships with mentors. This will be an important part of the process. A good mentor can help you identify gaps in your skills and guide you in developing a plan to address and close those gaps. See Chapter 11 for more on ﬁnding the right mentor. For example, if you are currently a manager, you may need more advanced skills in engineering, ﬁnance or some other area in order to be promoted to director. Because you are unlikely to move from one role to the next in one leap, you should plan your career moves to focus on positions where you can gain the needed knowledge and experience to help you advance. Career progression usually requires a lateral move or two. Time spent in those lateral positions is likely to help you in the longer term. The key is to make sure every move you make adds some- thing—skills, experience, knowledge, content, network—to help you succeed at the next level and move closer to your ultimate goal. Without a plan, you don’t know if you are going in the right direction or staying on course. 1. End It: Write down where you want to be when you retire, and when you expect it to occur. Include whatever means the most to you—your net worth, your level, your location or whatever else is important. 3. Plot It: Take steps in ﬁve-year increments to get you from where you are today to where you want to be. 4. Talk About It: Show your partner, or a close friend or relative, your plan. See if this significant person in your life can offer further suggestion on how best to achieve your goal. 5. Take It: Make the first step towards your goal. 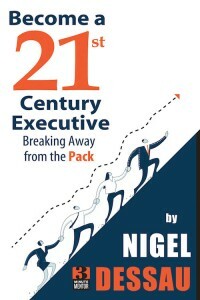 Extracted from “Become a 21st Century Executive“.